The annual Halloween draws closer and closer. For kids trick-or-treating cannot be too appropriate to get entertained at Halloween, while for adult after some tedious work, preparing some horror movies for Halloween is a good way to relax and experience the scary Halloween mood. However, the format issue could be a wet blanket if you want to watch Halloween movie on iPad since some movies cannot be read by the Apple's tablet. In allusion to this problem, the following guide shares a solution to convert Halloween movie to iPad supported format for unlimited video enjoyment. 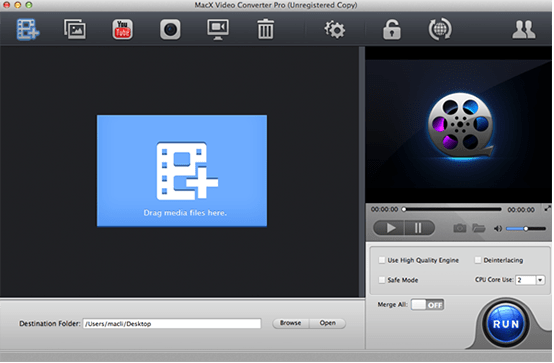 MacX Video Converter Pro stands up to our tests and is definitely worth your try. It helps to convert any Halloween-themed movies like Insidious 2, Halloweentown, Corpse Bride, etc, and transfer these videos into an iPad, including the latest iPad Pro/iPad Mini 4, with lossless quality and world's No.1 fast speed. Therefore, you can add the Halloween movies to iPad and watch them at Halloween anywhere. Below is how to convert Halloween movie to iPad on macOS. Optional: After downloading Halloween horror movies, you can use the easy-to-use MacX MediaTrans to transfer Halloween horror movies from computer to iPad Pro, iPad Mini, iPad Air series, as well as iPhone X/8/7/Plus, iPhone SE/6s/6/Plus/5s, iPods without worring about any video audio incompatibility issue (this movie transfer tool is built with auto video conversion feature). It also supports you to super fast transfer Halloween theme music, photos, ringtones, iBooks, iTunes U, etc. from Mac to iPad iPhone, and vice versa in seconds only. Free download this iPad video converter on Mac, install and run it. Import source video by clicking "Add File" button. You can also add more than one movie files and convert them at one time. Choose the output format as you like. To transcode Halloween movie to iPad on Mac, simply hit Apple Device -> to iPad Video and choose the iPad Mini 4, New iPad Pro, iPad Air 2 as the output format etc. Tips: if you want to make these Hollywood Halloween horror movies stylish, you can click the "Edit" button on the main interface and then add watermark before video conversion. Also, it allows you to trim video to get preferred segment, crop video to better suit your iPad screen and even add external subtitle for your needs. Hit the "RUN" button to start decoding Halloween hollywood movies to iPad on macOS. After a few seconds, you can sync and add the converted Halloween movie to iPad for playback at Halloween. 2016 best horror movies Guide: quick view all top horror movies of 2016 and learn how to easily download horror movies in 2016 for free enjoyment from 1000+ online sites. What are the best new movies on DVD 2016-2017? Here is a full list of new movies releases on DVD available in all genres with release dates, casts, ratings, reviews etc. Crying for the top 2016 movies to add to your watch list? Here we've compiled a list of top 10 movies in 2017-2018 best Hollywood movie year, as well as the most-expected movies to be released in 2017-2018. Besides, guides on how to download free movies/HD trailers of 2017-2018 are also included in the roundup of the best movies 2017-2018. 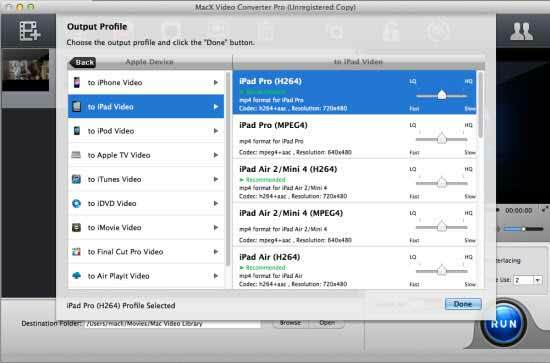 MacX Video Converter Pro is a reliable video converter to let you convert Halloween movie to iPad series with high quality and incredibly fast speed. It also provides superfast solution to download Halloween theme music, videos and movies from 1000+ online sites.